They began modestly enough as the New York Highlanders in 1903, owned by a couple of New York bartenders who laid out $18,000 to buy the Baltimore franchise and bring it north. For their first 18 years in New York the Highlanders (they became the Yankees in 1913) seriously challenged for a pennant only once, in 1904 when star pitcher Jack Chesbro set a modern day record with 41 victories, completing a staggering 48 games and posting an ERA of 1.82. Some great players passed through New York in those years, including Wee Willie Keeler, Hal Chase, Roger Peckinpaugh and Frank Baker, but the Yankees were always also-rans. That all changed in 1920. The Yankees completed the famous deal to buy Babe Ruth from the Red Sox and also brought along some of Ruth's more talented teammates, including third baseman Joe Dugan and pitchers Carl Mays, Waite Hoyt, Herb Pennock and Bullet Joe Bush. With Ruth and a solid pitching staff as the seedlings, a dynasty sprouted. Yankee manager Miller Huggins guided the team to its first three pennants in 1921-22-23. They played the New York Giants in all three Series, losing the first two and winning in 1923, the year they moved into Yankee Stadium. In mid-decade the team added a strapping young first baseman named Lou Gehrig to give the Yankees an unprecedented 1-2 punch that along with supporting hitters Tony Lazzeri, Bob Meusel and Earle Combs came to be known as "Murderer's Row." They won consecutive pennants again in 1926-27-28, winning the latter two World Series in four game sweeps. The 1927 team is considered by many baseball historians as the best of all time, with Ruth hitting his Olympian 60 home runs (more than any American League team hit that season) and Gehrig hitting 47. Gehrig had more runs batted in - 175 to 164. Huggins died suddenly in 1929 and the Yanks were derailed for a few years, returning to the Series and sweeping the Cubs in 1932 with new manager Joe McCarthy. Ruth was gone two years later. However, the Yankee machine would enter an era of dominance rarely matched in the game before or since. The Yankees won four consecutive world championships from 1936-39, winning the pennant races by wide margins. They scored close to or more than 1,000 runs in each of the four seasons with a punishing batting order that consisted of Gehrig, Lazzeri, catcher Bill Dickey and a talented and charismatic new outfielder named Joe DiMaggio. DiMaggio played anything like a rookie in 1936, hitting .323 with 29 home runs and 125 runs batted in. In fact, DiMaggio was one of five Yanks to drive in more than 100 runs that year. Although the Yankees lost Gehrig to the disease which claimed his life and now bears his name, they kept rolling. They won three more consecutive pennants in 1941-42-43. They defeated the Dodgers in 1941, and split the next two with the Cardinals. McCarthy resigned after three consecutive middle-of-the-pack finishes and Bucky Harris led the team to another championship in 1947, during which Yogi Berra made his debut. After a disappointing 1948 season, the team surprised everyone by naming former National Leaguer Casey Stengel as manager. Stengel started out winning five consecutive world titles from 1949-53. Unlike their Bronx Bomber predecessors, this Yankee dynasty was fashioned around pitching; the trio of Vic Rashi, Allie Reynolds and Ed Lopat were the bedrock, joined in 1951 by a New York-born lefty named Whitey Ford. This is not to say these teams did not have offense. There was still DiMaggio, and when he retired in 1951 Stengel oversaw the transition to Mickey Mantle in center field. Berra was winning three Most Valuable Player awards and a hard-nosed outfielder named Hank Bauer was the new team sparkplug. With the exception of 1959, the Yankees were in every World Series from 1955 through 1964. They beat up on the Dodgers frequently (only losing to them in 1955 and 1963), and traded championships with Milwaukee in 1957 and 1958. By this time Mantle had reached the heights of a triple crown season in 1956 (.353, 52 home runs and 130 runs batted in). The Yanks would lose the 1960 World Series despite outscoring Pittsburgh 55-27. Some of Stengel's pitching decisions did not sit well with the front office and Stengel was gone shortly after Bill Mazeroski finished his triumphant trek around the bases in the bottom of the ninth in Game Seven. The Yanks served notice that the Series upset and a new manager (Ralph Houk) would not derail them. They rewrote the record books in 1961 with Roger Maris hitting 61 home runs to beat Ruth's single season record and Mantle clubbing 54. The team hit a record 240 (with no designated hitter), a record that stood until 1996. Whitey Ford won 25 games and led the Yanks to a five game win in the World Series. They won it all again in 1962 against the Giants and also won pennants in 1963-64. However, suddenly the bottom fell out and the Yankees stopped winning. The veterans grew old, the farm system was dry and the fans were bored with the Yanks' almost-inhumanly methodical winning. What the Yankees had accomplished to this point was staggering. Since the start of their dynastic run in 1921, they had won two-thirds of all the American League pennants and almost half of the world championships (20 in 43 years). After a decade of wandering the wilderness of mediocrity, the team returned to the top, infused with new leadership and cash from George Steinbrenner, who bought the team in 1973. The Yankees again won three consecutive pennants in 1976-77-78. Catcher Thurman Munson hit over .300 and drove in more than 100 runs three consecutive years, but a loss to Cincinnati in the '76 series prompted the team to sign free agent slugger Reggie Jackson. Jackson made a permanent name for himself in Yankee lore with his postseason heroics, especially in the 1977 World Series when he capped the Yanks victory with three homers in the decisive sixth game. In 1978 the team erased a 14 game deficit to catch the division leading Red Sox, and then defeated them in a one-game playoff sparked by Bucky Dent's three run homer and Jackson's solo shot. The team subdued Kansas City and Los Angeles for another world championship. The 1979 team was erratic and dispirited by the death of Munson in a plane crash on Aug. 2. The team rebounded in 1980 to win 103 games, but lost the American League Championship Series to Kansas City. They returned to the Series in the strike-shortened 1981 season, only to lose to the Dodgers in six games. Through the rest of the decade the team hit a slow decline. Chaos in the front office resulted in a revolving door of managers, the bleeding of talent and a suspension of Steinbrenner for misconduct. A rejuvenated farm system, astute trades and free agent signings built the team into a wild card winner in 1995, but a loss in the divisional playoffs to Seattle cost manager Buck Showalter his job and brought the dawning of the Joe Torre era. Torre led the Yankees to the postseason in 12 of his 13 seasons at the helm. He departed after the 2007 season following a salary squabble with management to manage the Dodgers. He blended veteran hitters such as Paul O'Neill and Tino Martinez with younger homegrown talent such as Bernie Williams and Derek Jeter, liberally adding pitching talent such as Andy Pettitte, David Cone, David Wells and Roger Clemens. Closer Mariano Rivera was the icing on the cake. Torre’s tenure resulted in six pennants and four World Series rings. The winning beat continued when Joe Girardi took over as manager in 2008, then one year later, he led the team to its 27th world title. Steinbrenner died at age 80 during the 2010 season, but by that time he was in ill health and had ceded much of the ownership decisions to sons Hal and Hank. The Yankees latest dynasty from 1995-2010 included playoff appearances every season but 2008, and five more world championship trophies in their case. Love them or hate them because of their free-spending ways, the Yankees were the barometer of success for baseball and sports in the 20th century, and are off to a rousing start in the first decade of the 21st century. Did you know that on September 28, 1923, the New York Yankees set a team record for hits during a game with thirty versus the Boston Red Sox ? 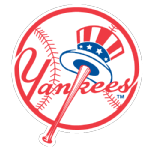 On July 6, 1920, the New York Yankees set a team record for runs scored during an inning with fourteen in the fifth inning versus the Washington Senators . The Bronx Bombers set a team record for Opening Day attendance on the 1998 Opening Day game (April 10) when 56,717 fans showed up at Yankee Stadium .